Random Stuff From The Top Of My Head. I can say that the last part of 2011 and the early days of 2012 had been short of... hard. Apart of all the problems that life throws at us, every now and then, life gives you a full dosage that sometimes is too much to digest. In some circles it's what is called the changing of the guard. This term refers to the formal ceremony in which sentries providing guard duties at a highly important place are relieved by a new group of fresh individuals that will take charge of such responsibility. In our human life, this process happens when the elders of our family pass away. Death is the surest thing that will happen to every one of us at some point of our lives. It is the natural process that renews human existence. But at what cost? It seems that most people are not ready for it. Are you ready? I know that I'm not. Not now, not yet. But when death comes, it rocks our lives like a MOAB hitting our very core. I'm not talking about when we finally die; what I'm trying to say is when the, not so ceremonial, changing of the guard occurs in our families; the things that were true and, in our heads, everlasting just change. 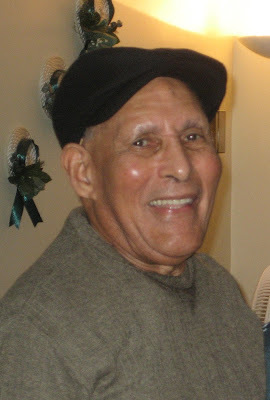 Almost 4 months later, on January 5 (or 6 depending on your time zone), 2012; my grandpa, Juan Vásquez, died. He got really sick after my father's birthday party. At the hospital, it looked like he was going to get better, even talking with the people that came to visit him. But like every good thing is life, it was short and a couple of days later he passed away; with my father and my brothers at his side, just like that. I remember the days when my stepfather used to lent me his car so a could learn how to drive and when in a rookie mistake, I crash his new Astro van, with the side post of our house entrance, wrecking the right side, just days after he took us to the mall so a could get out, from layaway, my Nintendo 64, circa 1996. Abuelo, 4 years ago. Enjoying his family. Every one of us know that this is life. Death as much as we don't like it, is part of us. Like they say: As soon as you are born, you begin to die. I don't like it. I don't want to accept it, I don’t want to believe it; but is true. More so when it hits you in the face like that. Victor; you will be miss, dearly. Thanks for everything. Abuelo, patriarch of our family, I will never forget you. For both of you, I will see you soon. On October 6, 2011; just a few hours after I had talk to him, my stepfather, Vitalino Pagán, pass away. For me it was in an instant. He got sick, was at the hospital, getting better. I missed a call from my mother; and when I called back, my mother; with the saddest tone that I had ever hear, told me: "Victor (as we used to call him) just die". Usually, I'm the kind of person that always stays calm. Always keeping my cool. I just said, asking myself: "What?” I just could not believe that a person that was joking with me less than 24 hours ago, has just die. My grandpa, for me, the living definition of a man. Taking care of his family. Always getting up early in the morning, going to work in his bike. Getting home after 5pm, reading his newspaper at the front porch. He used to have this old green chair, made with wood and some kind of straw that he always used to sit on to watch TV. How he use to pull my ear every time I misbehave. Telling me how a man should conduct himself, and how I should learn from other people mistakes; making myself better. Those where the summer months at my grandma's, in San Francisco de Macorís, Dominican Republic. This work by juanvasquez.me is licensed under a Creative Commons Attribution-NonCommercial-NoDerivs 3.0 Unported License. Site contents © 2011-2019 by Juan Vasquez. Some rights reserved. Simple theme. Powered by Blogger.